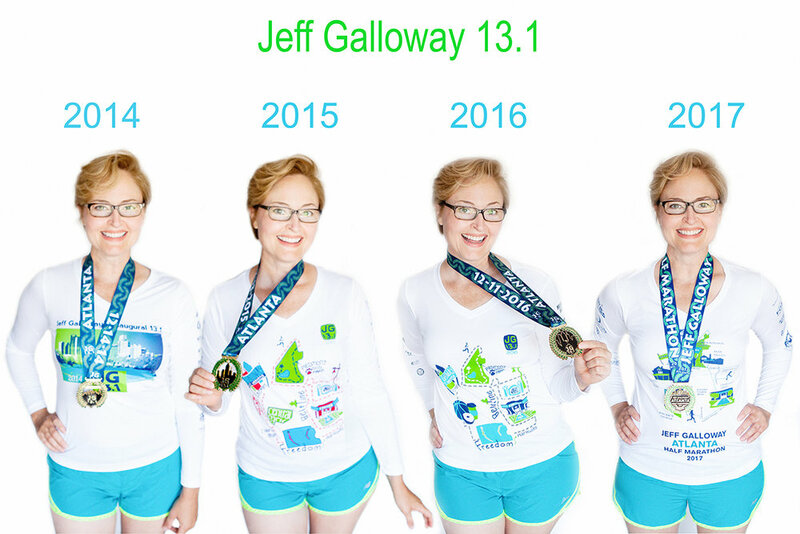 I had some fun today taking some portraits in my Jeff Galloway 13.1 t-shirts and medals. The first Jeff Galloway half marathon was in 2014 and I've done the race every year as a virtual participant. As a virtual participant you can sign up for the race and clock it on your own watch/gps/mile tracker and then submit your results. Then you receive your t-shirt and medal in the mail. So that's what I did 2014, 2015, 2016, 2017. This year I'll be at the race in Atlanta, in person, for year 5! I'm so excited to be an Ambassador for the 2018 Jeff Galloway 13.1. You can use my code: ambassador18 when you sign up (www.JeffGalloway131.com) and you'll get 10% off your race entry. I have followed Jeff Galloway's running training since my Dad coached me in track and cross country starting back in the 80's. My Dad still has Jeff's first edition Galloway Book on Running that came out in 1984, and that's the book he used to coach me. I have so many wonderful memories training and running with my Dad. Jeff Galloway has been a big influence on our lives which makes it even more special to get to meet him in person in December at the race. And to be an Ambassador!!! Well, I'm over the moon and around the sunshine excited about it!!! That excited y'all! Below are photos of my t-shirts and medals from each year. Follow me on Instagram (@JennKL), I post more there about training and weekly runs. Also, I highly recommend the book I mentioned and linked to above, Galloway Book on Running.